Hello everyone from Zion National Park! Since I last wrote, Tom and I spent two more days at Maple Canyon. Five days was sufficient for now, until we return in two weeks for another two days. In all, Maple was wonderful. 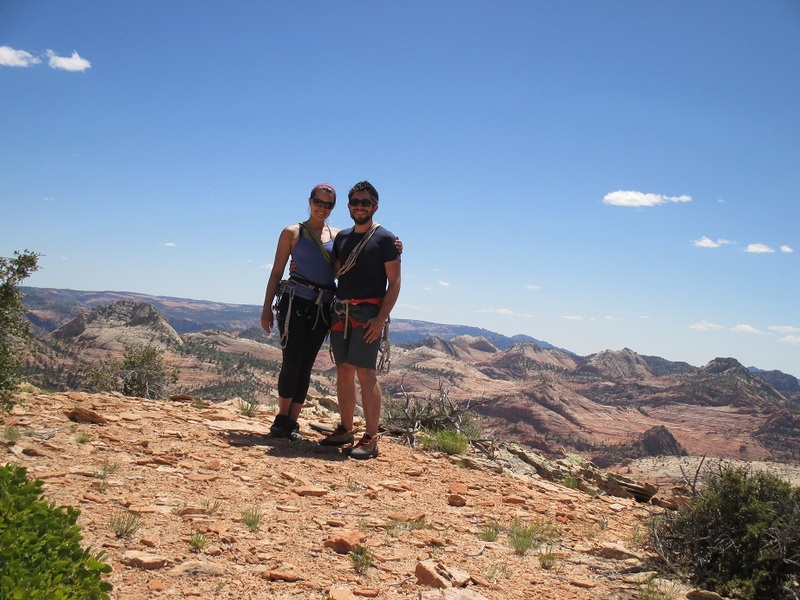 We enjoyed our secluded camp site, the easy approach trails, and the beautiful climbs and views. Tom spent a lot of time on 5.12a climbs, while I focused on leading between 5.7 and 5.9, with one 5.10b lead climb. I have been trying to get my endurance back up, as bouldering for the last year has left me with increased strength and technique for hard moves, but low ability to sustain myself on 30 metre routes. Highlights from Maple Canyon include the 5.8 three-pitch climb called The Great Chasm, The Pipe Dream Crag where Tom played on some 12s and I lead an overhung 10b, and the many breezy 5.6, 5.7, 5.8, and 5.9s that I sent on Oxygen Wall, Billy the Kid, Engagement Alcove, Simpson Wall, and Orangutan Wall. I hope to climb some harder stuff when we return, but I am very pleased that I am getting some good lead practice. And finally, another highlight was meeting a nice couple from Colorado called Sarah and Zach, who were on a long road trip, just like us. 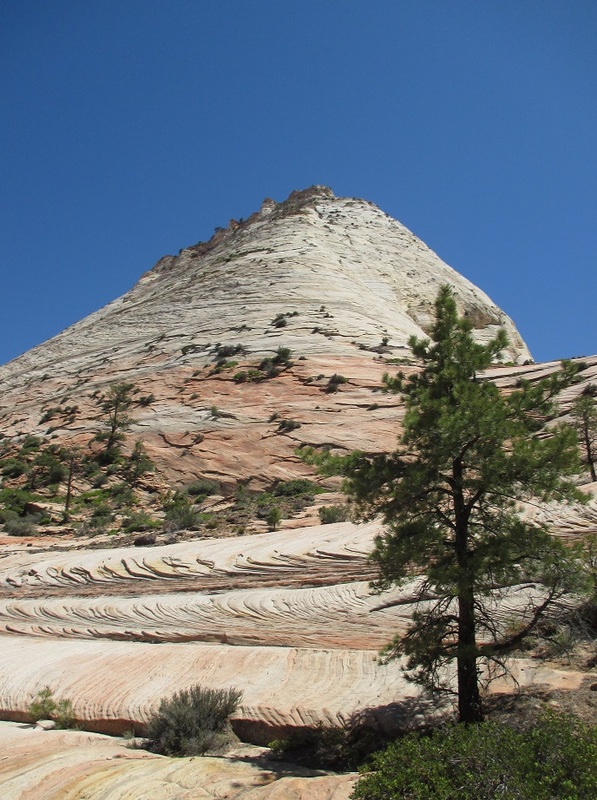 We drove from Maple to Zion, and camped for free in a back road. Our little car struggled to get up the dirt road, but we made it, and the view was spectacular. The next morning we got up at 7:30 and went straight to the Zion campgrounds to race against the other million tourists who also wanted to secure a camp site. We thankfully found one, and then spent the day hiking. 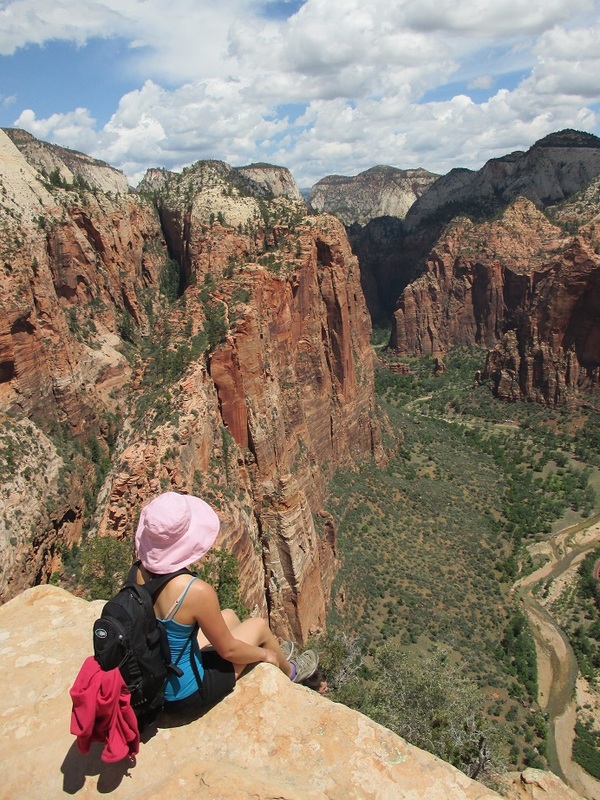 We started with Angel’s Landing, where we were surrounded by hundreds of other tourists who wanted to do the same. 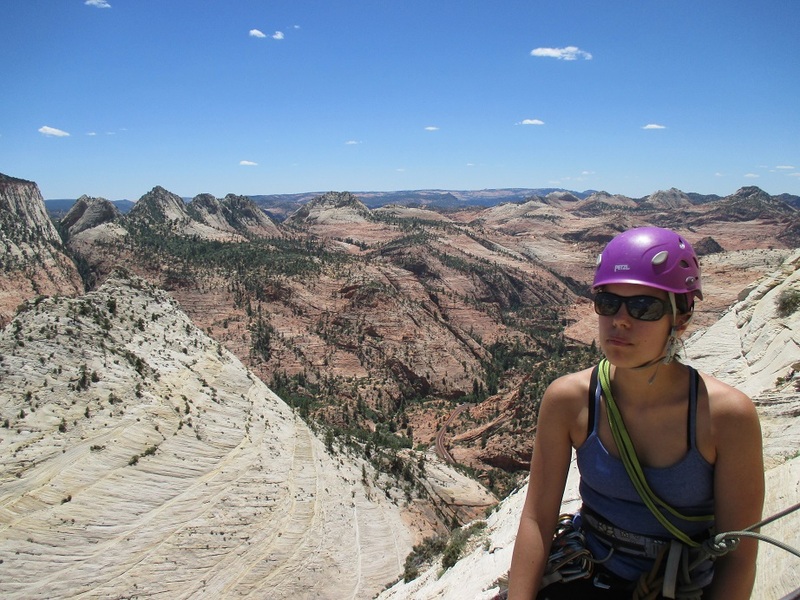 We hiked Walter’s Wiggles, and cruised the chains that brought us up steep cliffs to the top. When we got back to the bottom, two and a half hours later, we had lunch, then hiked up another trail called Observation Point. 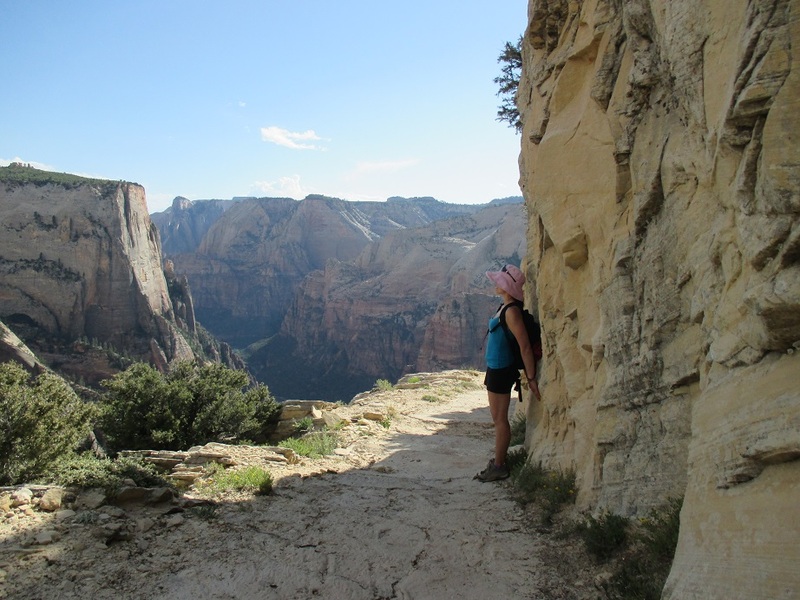 This hike took longer, but was less steep, and the view was incredible. 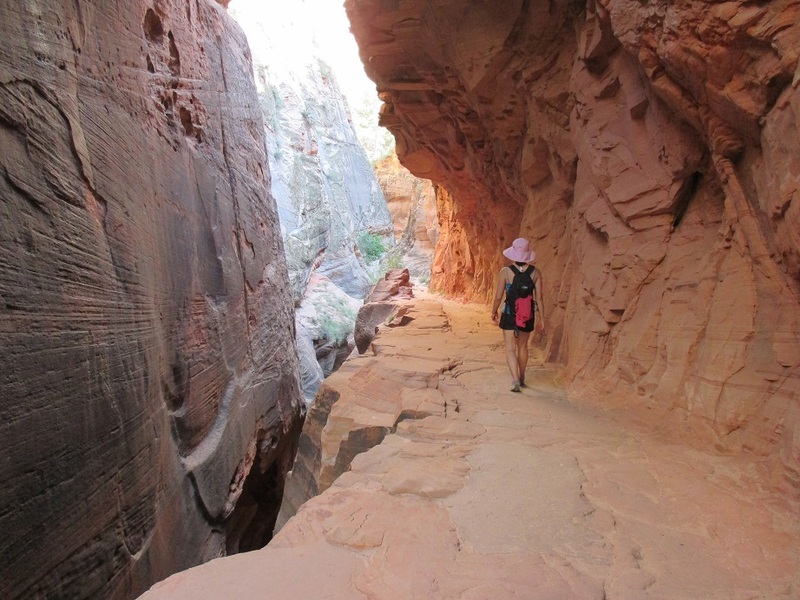 Day two in Zion was spent hiking the Narrows, a hike that is almost entirely in a river; at times we were waist-deep in the river, other times we hiked on pockets of land. Using hiking poles to help keep balance, we hiked about 2 ½ hours in the river, surrounded on either side by 1000-2000 foot-tall red walls. At its lowest distance, the walls were 6 metres apart. We turned around when we did because to go on required going up to our chests in water, and we figured we had already seen what there was to see. Plus, we were chilly. 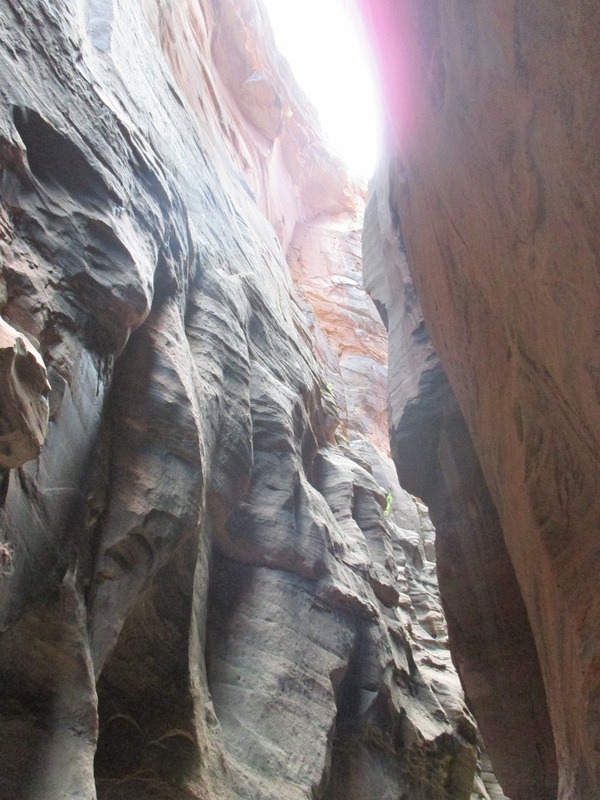 The Narrows was great; I loved being in the water. 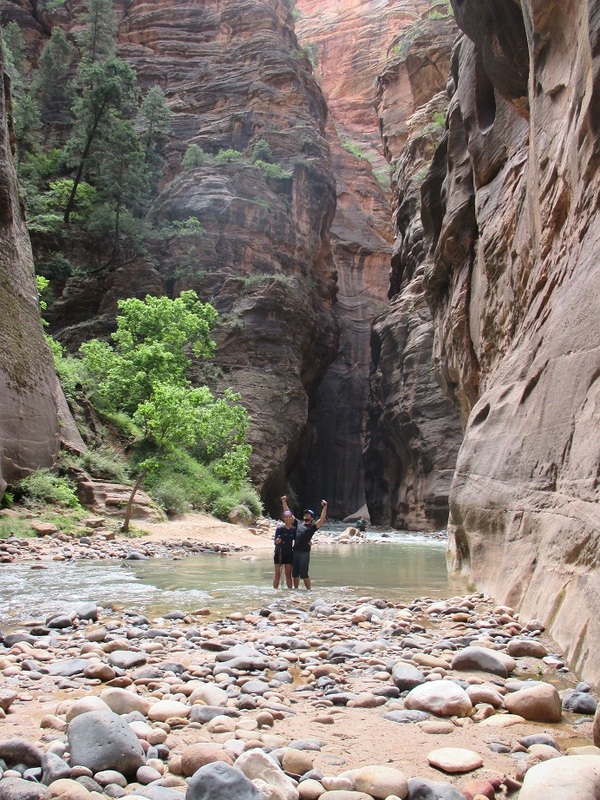 During our third and last day in Zion, Tom and I hit the back country, where we were alone the entire time. We rock climbed a multi-pitch called Led by Sheep; this climb gets its name because the mountain sheep climb the steep slab to the top to feed off the plants. It was a very enjoyable climb, rated 5.5 slab. The hardest part was the class-three slabby approach. We were both hot and exhausted, so we went for an ice cream in the touristy town centre afterwards. Great adventure! 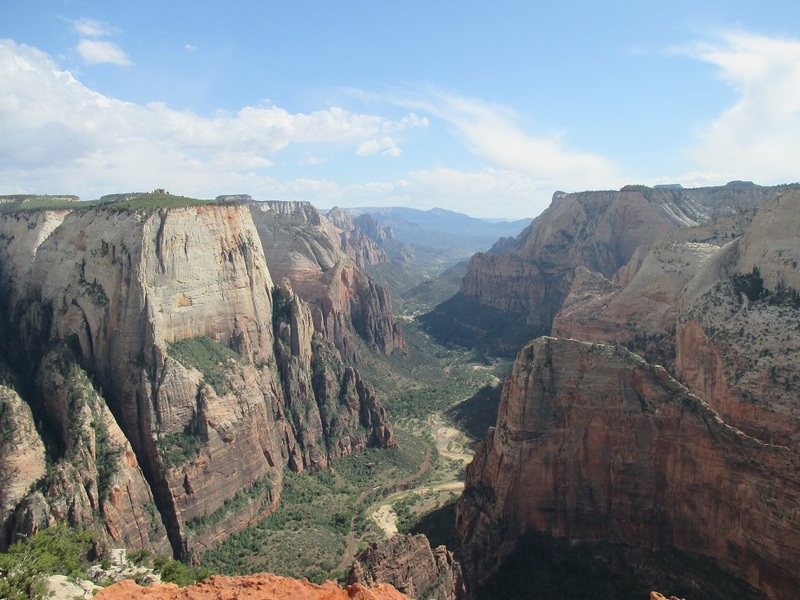 Today our Zion adventure comes to an end, after we visit Kolob Canyon, which is still part of Zion National Park. Right now we are resting at a cafe, freshly showered, and waiting for a load of laundry to finish. Thanks for reading, and for the encouraging and supportive comments. Much love to friends and family back home. Thank you, Auntie Anne! I wish I could take you climbing – it’s such a thrill!